Reconditioned Kirby G6 vacuum cleaner. Includes new deluxe GV tools kit. 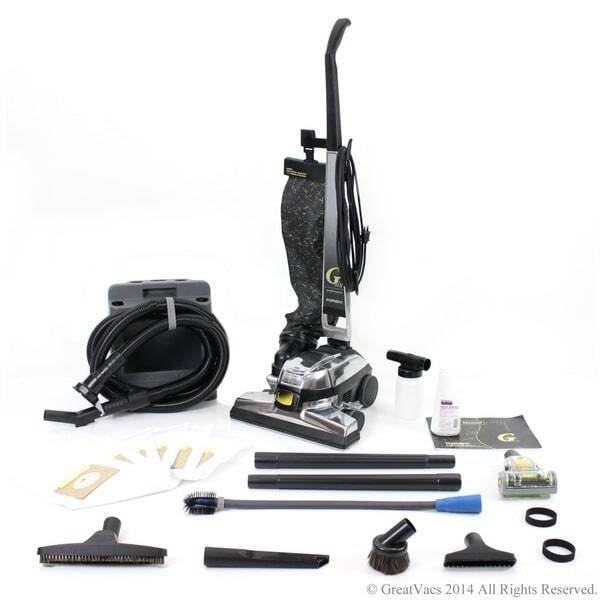 Also comes with GV mini turbo nozzle with geared belt and spinning brush roll, 12 foot crush proof hose and horse hair floor tool. The turbo mini head is ideal for pet hair, mattress, upholstery and cars. We also add is 9 new 3M HEPA, 3 new GV belts (one installed), hand held shampooer, 1 12oz bottle of kirby spot remover, and inflator/refrigerator coil cleaner. Kirby vacuums are the most dependable vacuum made. A popular consumer reporting magazine recently ranked it the most dependable vacuum made and to see them running perfect after 30 years is very common. This is not a disposable vacuum like most vacuums but a high end vacuum. Best deep cleaning vacuum. If you are looking for a vacuum that is a powerful deep cleaner then this is it. The Kirby is designed to deep clean your carpets and is a very powerful cleaner. HEPA Filtration for allergies- with the HEPA bags this is designed to filter down to .1 microns. Most other HEPA filter vacuums only filter to .3 microns. Large centered tube makes the Kirby ideal for pet hair clean up. The tube brings hair straight up in tot he bag which does not allow hair to wrap around brush roll as easily.